The core of the founders of ‘Mantzaros’, comes from a socialist group, which was active in Corfu in early 1890, but we do not have more information, unless the fact that they had, as their base, a place at the street ‘Agion Panton’. Before June in 1890, it was prepared the creation of the precursor form of the band. The first regulation, including 28 articles, was voted at a meeting at the Saturday night on June 21, a meeting which should be considered as the establishment of the new club. The minutes of the meetings of the ‘Recreational Association’ don’t specify, under what circumstances, the Music Band prepared its first performance, on the first Sunday of November in 1890. The newspaper ‘Epoptis’, some days before published: ‘Next Sunday, if the weather will allow us, the music of the newly established ‘Recreational Association’ will accompany the litany of the saint-protector of Corfu. On its next print mentioned: ‘Last Sunday, the Philharmonic Band of the Music Club ‘Mantzaros’ performed for the first time ever. The main body of the founders, after the 25th of October, met on 8th November, in the place of the Music Club ‘Mantzaros’. There is no information, about how and when was decided the rename of the club, despite the fact that the preserved number of the meeting is full. Since the meeting on the 18th of November in 1890 and then, it became established the title ‘Philharmonic Society Mantzaros’. During this meeting, it was discussed and voted the new charter. In the 1st article of the charter, it was defined the purpose of the Society. Mainly, the purpose of the band was the entertainment of the working class. The 5th article was determining 100 founders, who had to belong to the working class of Corfu. On 1st September 1891, was proposed the celebrating of the first anniversary of the establishment of the Society. During this year (1891), the anniversary wasn’t celebrated, due to the death of Dutchess Alexandra. However, it is clear that the celebrating of the First Sunday was the first performance of the music band on the 4th of November in 1890, during the period that still operates the ‘Recreational Association’. In the litany of the First Sunday in 1891, the music band had 40 musicians, while the 6 of them were new musicians. In a period, when the social insurance was something unknown, it was remarkable the action of the Board of Directors of ‘Mantzaros’ to create the Funds of the Musicians, for the patients. Also, it had to consider, if the musicians wanted to give a part of their tips for the Funds. At the meeting of the 11th of October was highlighted that, according to the 49th article of the Special Regulation, the patients had to be provided with the necessary medicaments, doctors and food (meat), during their disease period. In 1896, they took place in Athens, the first modern Olympic Games. In the minutes of the Founders Body on 5th of March, we can read: ‘…the President mentions many things related to the transport of the music band in Athens for the Olympic Games and submits to the body, the correspondence, which took place between the Board of Directors and the reception committee, asks for the opinion of the body about the fact.’ After the end of the meeting, the president’s proposal, about the transport of the music band in Athens, was accepted, in case of ensured cover of the expenses. The Mantzaros Philharmonic took part, with the Old Philharmonic, in the torch relay, which was on the 31st of March: ‘…after them, the students will come after the Philharmonic band of Corfu and after it… then, other philharmonic bands will come, before the other parts, such as the Philharmonic bands of Lavrion, Lefkada, the second of Corfu,…’. On the 15th and 16th of April in 1901, it was voted the new charter. Now, the purpose of the Society was the ‘Teaching and Prevalence of the Music Art’, instead of the previous purpose, which was the entertainment of the working class, while it was abolished the qualification, that the founders had to come from the working class of Corfu. The musicians were no more able to take part in the Board of Directors and they couldn’t be elected as Founders. The First Sunday of November in 1907, the music band performed for the first time, with caps similar to the form of the caps of the music band of the Philharmonic Society of Corfu (Old), performing a religious march, which was composed by the musician Spyros Doukakis. During the next years, the ‘Mantzaros’ participated in many Greek and international events, outside Corfu. It, generally, played a great role in the music history of the Ionian Islands and it was the ‘nursery’ for some of the best musicians, while the music band was directed by many famous Greek and Italian conductors. Apart from its theoretical schools and the brass and percussion instruments schools, it had also classes of piano, singing, violin, viola, cello and double bass, while sometimes had a mixed Orchestra and Choir. In 1950, it was founded the Phonetics School, under the direction of the conductor Alexander Greck and in 1952 it was founded the Symphonic Orchestra. In 1974, it was created the school band ‘bandina’ and in 1982, the part of the Cheerleaders. In the same year, the Music Band made some really impressive performances in a Bulgarian Festival, as well as in the closing ceremony of the European Volleyball Games, at the Peace and Friendship Stadium. However, the greatest award for the Philharmonic Society was in 1987, when it was awarded by the Academy Of Athens for its contribution to the music education of the country. In May of 1990, in order to celebrate the first 100 years of the Society, it took place a magnificent performance of the Music Band, the Bandina and the part of the Cheerleaders, in the music hall ‘Palace’ of Athens. The Philharmonic Band has participated in many philharmonic festivals in Greece and abroad, with its top performance to be this in Vienna, at the 17th European Philharmonic Festival in 1996, where it won an honour. Also, it has performed concerts in many places in Greece (Argos Orestiko, Lefkada, Kefalonia, Syros, Rhodes, Kalamata, Athens, Thessaloniki) and abroad, with its top performances to be the concerts at the international exposition EXPO 2000, in Hannover in Germany, where it won some great comments. Additionally, the band has performed concerts at the Greek National Opera in May of 2003, at the Music Hall of Athens in 2009 and at the Music Hall of Thessaloniki in 2011, with remarkable success. The Philharmonic Society ‘Mantzaros’ was awarded in 2005, by the Organization ROBERT SCHUMMAN, for its contribution to the culture. Since 2013, with an initiative of the Board of Directors, it presents in live broadcast, performances of opera and ballet, from the METROPOLITAN OPERA of New York and the ROYAL OPERA HOUSE of London. 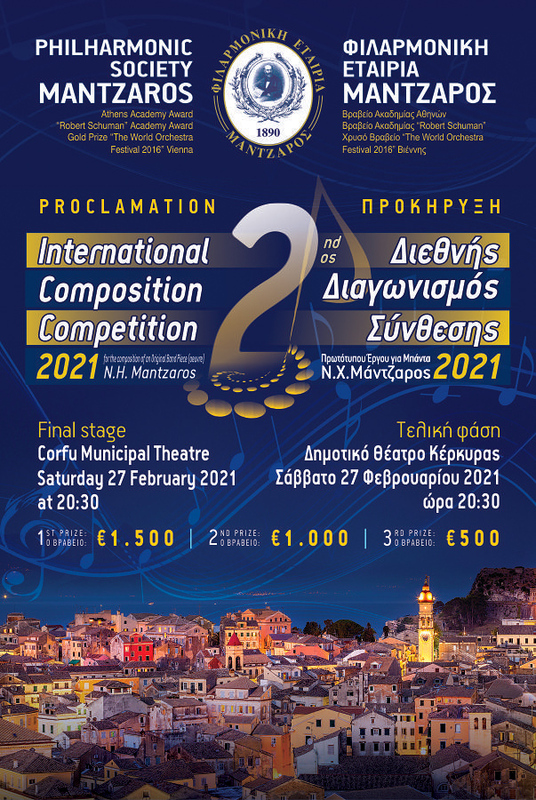 This is a contribution of the Philharmonic Society to the culture of Corfu, while being also an innovative action, which opens a window to the international cultural events. The Philharmonic Society ‘Mantzaros’ is already in its 123rd years of its history and it continues to contribute, in every way, to the preserve and the refreshment of the cultural tradition of Corfu.